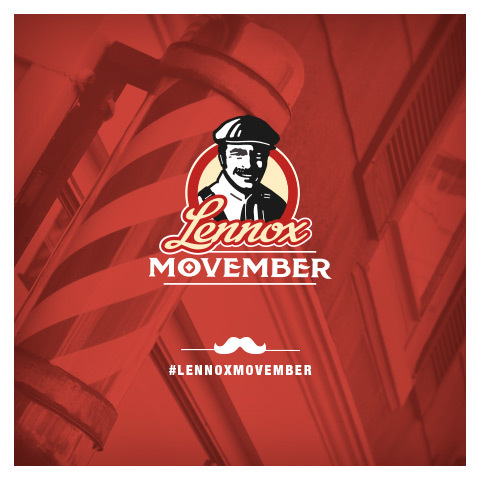 Lennox partners with Movember annually to spread the word and raise awareness about men's health issues. Dave Lennox has actually been the face of the Movember social campaign for the past few years, sporting the great mustache that he has. 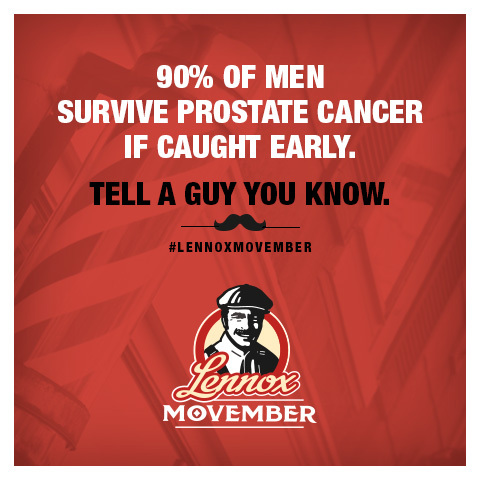 For every content share/RT on the Lennox Facebook page and Twitter page during the month of November, Lennox will donate $2 to men’s health issues. On Instagram, for every like or comment, Lennox will donate $2 as well. So I encourage you to follow and like them to so that we can all show our support. They will be posting content on all of their social channels throughout the month that provide information about men’s health issues. They also will be showcasing inspiring stories from men and women that have been affected by these issues, whether personally or by someone they know. The tagline, “Tell a guy you know” speaks to the Movember campaign and how its purpose is to educate others and create awareness around important issues. So if you have a man in your life, be it a father, brother, cousin or just a friend, join the Movember movement and share away. Let's help the men in our lives live longer and happier lives. Start growing and start sharing! Let's discuss: Will you be joining in the Movember Movement and help bring awareness to men's health? Here are the ways to connect with Lennox and show your support for Men's Heath! For sure. My father-in-law had prostate cancer twice. It's really scary and I'd love to draw more awareness. This is a great initiative, and I'm glad you shared this post, because I had no idea the reason behind all the mustaches. Thank you! It is so important for men to get those prostates checked. We all know it's no fun, but it's necessary! We know several people who have had prostate cancer. Luckily, it was caught early. It's important to raise awareness and let people know they need to get checked regularly! I have to share this with my husband. He didn't know what movemeber was and I couldn't remember! Prostate cancer is a terrible thing. I'm constantly on my husband about getting his routine prostate check. This is an awesome way to raise funds and awareness. These are serious issues and Movember has always been a fun way to spread the word. Nice post. Thank you for brining awareness. It is super importnat. So many lives can be saved. I think this is a great idea. Such a fun way to bring awareness! There is not enough information about mens' health issues available. This is a great way to get it out there. I feel like male targeted cancers aren't talked about enough. I love this post and the awareness it raises. I love this campaign. Men usually aren't as vocal and communicative as women and really need some help in bringing awareness to their issues. I will certainly participate and d my part. I am glad there are campaigns to bring awareness to important health issues. It is fantastic that the survival rate is so high if detected early. Men's Health issue's haven't been talked about on a regular basis as I feel like it should be. Even though as a women we do face our own health issues but Men have just about the same or more to look out for as they age. I'm glad you are bringing more awareness to everyone with Movember. I completely agree with you. Most men don't take good care of their health or themselves. I have to hound my husband to keep up with his doctor's appointments. Sorry to hear about your dad. My hubby is the type to refuse going to the doctor. I will be on his case to make sure he takes care of his health. The health issues pertaining to Men are rarely spoken about. The information they will need if they ever experience these health issues are hard to find so I am glad that Movember and you are raising awareness. I'm also sorry for your loss. No matter how long ago, the pain still lingers. We often hear about women's issues on blogs. I am so happy to see information about men's health.